ESPN is reportedly going after future Hall of Fame quarterback Peyton Manning for a spot in the “Monday Night Football” booth. With Jason Witten leaving the media world to return to the Dallas Cowboys, the network has an opening alongside Joe Tessitore and Booger McFarland for its Monday night broadcasts. In an effort to potentially fill that void, ESPN executives flew out to Denver on March 11 to meet with Manning, according to the Hollywood Reporter. Per the Hollywood Reporter, it’s not clear whether Manning, who retired in early 2016 after winning Super Bowl 50 with the Denver Broncos, is interested in making a move into broadcasting. Manning, with his prodigious football acumen and well-documented sense of humor, has been pursued by ESPN — and other networks — in the past. When Jon Gruden left the MNF booth before the 2018 season to take the head-coaching job with the Oakland Raiders, Manning reportedly turned down an offer to join ESPN. When Manning declined the opportunity, ESPN went with the three-man booth of Tessitore, McFarland and Witten with mixed results. Witten, a first-time broadcaster, became an internet punching bag for some of his rookie moments in the booth. The trio’s chemistry improved as the season progressed, as did Witten’s comfort level in his role. When Witten, seemingly out of the blue, decided to return to the field for the Dallas Cowboys, ESPN was left to look for a replacement. Manning, who has a presence at ESPN breaking down quarterback play for ESPN+ show “Detail,” could bring the kind of buzz the network is seeking, especially with Tony Romo’s ascendance at CBS. What will ESPN do if Manning says no? If Manning decides once again that broadcasting is not for him, ESPN would be wise to stick with the duo of Tessitore and McFarland. The two entered the 2018 season with familiarity from their days on ESPN’s college football coverage. McFarland, despite his strange perch from the so-called “Booger mobile” on the sideline, held his own all season long while Witten was widely criticized. 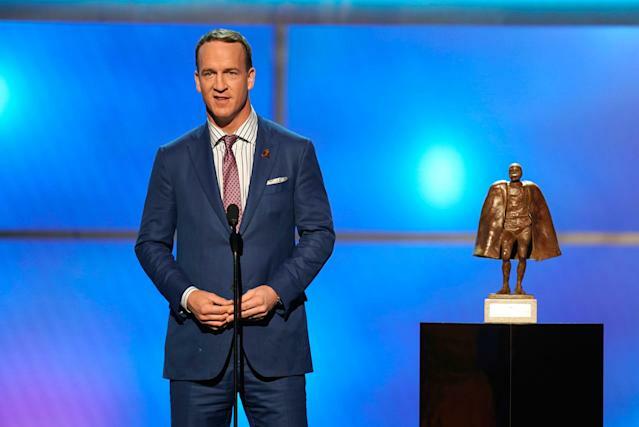 According to writer Jim Miller, who wrote the definitive book about ESPN, the network plans to move forward with those two if Manning turns them down. "They're going to have a two-man booth unless somehow Peyton changes his mind," Miller said on the “Sports Illustrated Media Podcast.” "They have a relationship with Peyton because of the ESPN+ show right now and Peyton has thought about this, but if you're Peyton, what's the upside?" "I believe from everything I've heard it's going to be the two of them [Tessitore and McFarland] and the only third possibility would be Peyton. Peyton is the only reason to pull up a third chair. If they start auditioning people and bringing somebody else in as a third that isn't Peyton, I'd be surprised and I'd ask, why?"